Recent release “Religion Confused? vs. the Higher Power Clarified!” from Page Publishing author Blue Seven-Seven is a collection of essays offering a real-world analysis of the often paradoxical results of strict adherence to religious doctrine, and a candid commentary on racial issues in American society. Blue Seven-Seven, a retired member of the US military, psychology and criminal justice professor, addiction counselor, soccer coach, and education coordinator with a varied and extensive career in management and leadership roles, has completed his book “Religion Confused? vs. the Higher Power Clarified!”: a slim volume of observations on the counter-intuitive realities of religious fundamentalism. This book is dedicated to recovering alcoholics and addicts all over the world. Blue Seven-Seven shares, “Although I have been counseling recovering alcoholics and addicts for over thirty years, an opposing force seems to interrupt the process. That opposing force appears to be religion. 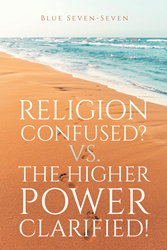 People in recovery seem to believe that the ‘Higher Power’ and religion is one in the same. "When expressing their inability to turn their will over to a Higher Power, they make the following statements: ‘Those folks in church are always judging me. It seems like they’re sharping their knives as I tell my story. They look down on me and act like they are better than me.’ I found that to be very detrimental to their recovery process. I did my best to explain to them that religion is a man-made concept, and that the ‘Higher Power’ is a divine existence well beyond man’s control. Apparently, they were talking about Religious Fundamentalists, which, according to World Atlas, are people who believe in the absolute authority of a sacred religious text or teaching of a particular religious leader, prophet, and God. "Beliefs and feelings, rather than fact, make Religion the most powerful phenomenon known to man! Published by New York City-based Page Publishing, Blue Seven-Seven’s book is an exploration of the distinctions between belief in and reverence for a higher power and strict adherence to the man-made aspects of organized religion. Readers who wish to experience this provocative work can purchase “Religion Confused? vs. the Higher Power Clarified!” at bookstores everywhere, or online at the Apple iTunes store, Amazon, Google Play, or Barnes and Noble.